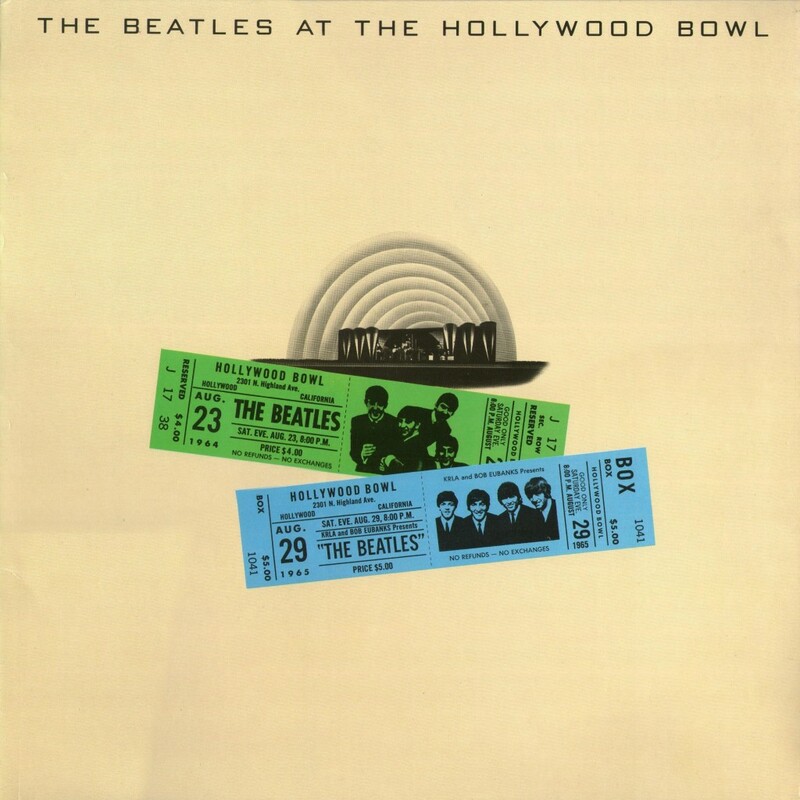 The Beatles Collection » The Beatles At The Hollywood Bowl, Parlophone EMTV 4, Music For Pleasure MFP 4156761 and Apple 602557054996. 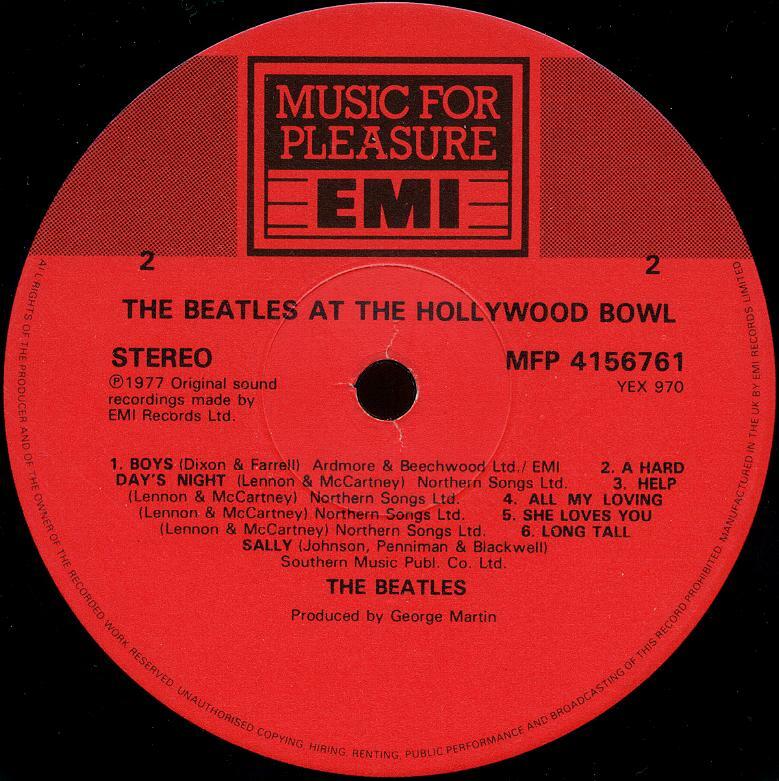 The Beatles At The Hollywood Bowl, Parlophone EMTV 4, Music For Pleasure MFP 4156761 and Apple 602557054996. 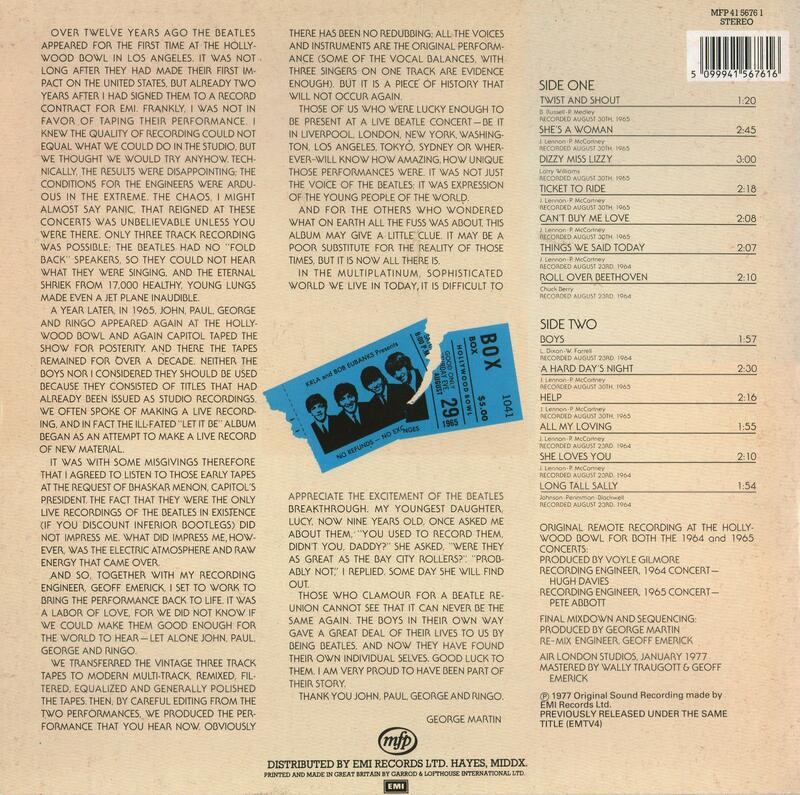 Album was released May 6, 1977. 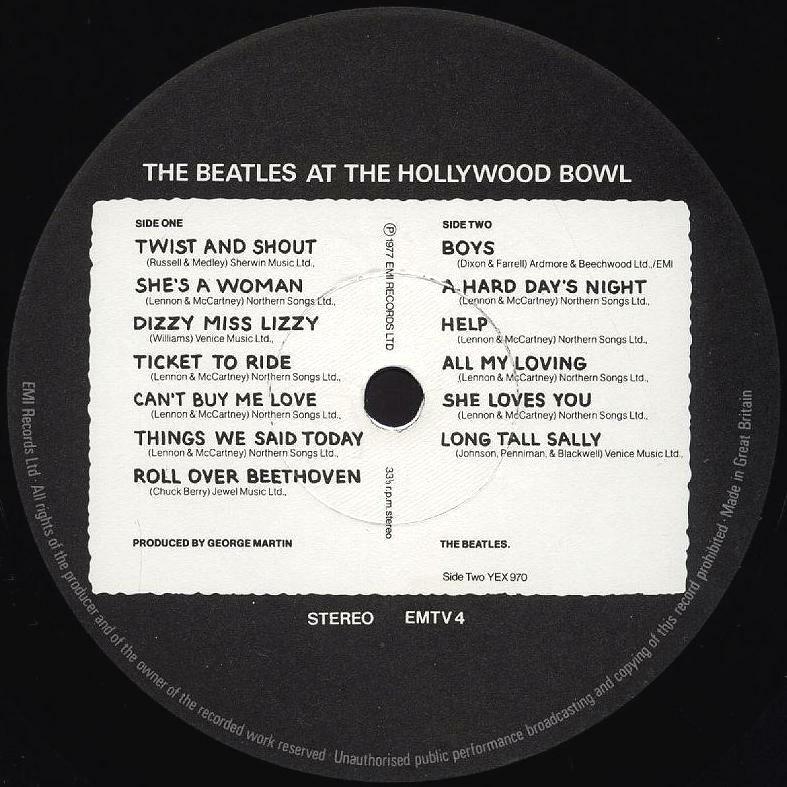 Of the 13 tracks, six “All My Loving”, “She Loves You”, “Thing We Said Today”, “Roll Over Beethoven”, “Boys” and “Long Tall Sally” are from the concert of 28 August 1964. 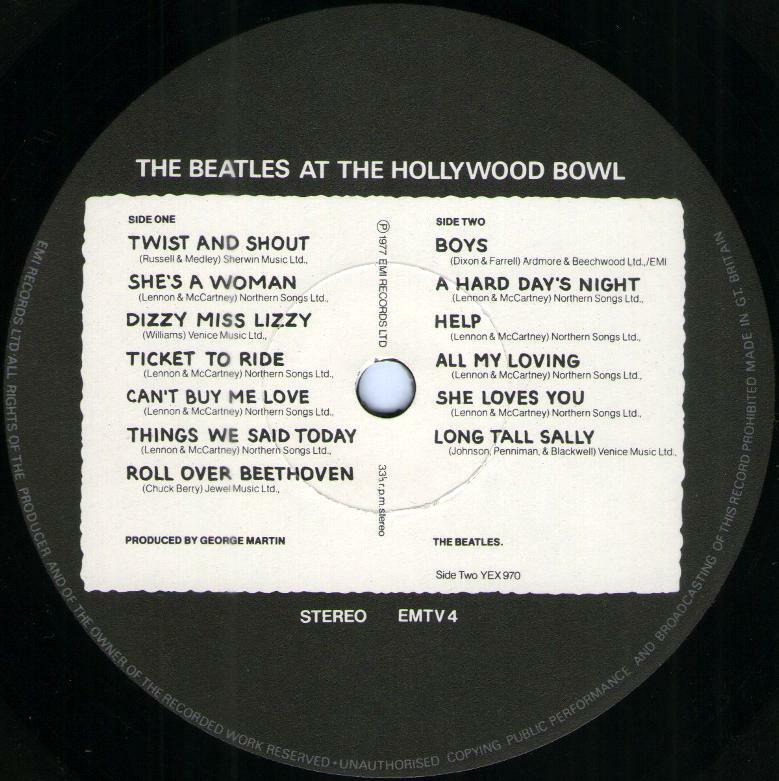 The remaining seven “Twist And Shout”, “She’s A Woman”, “Dizzy Miss Lizzy”, “Ticket To Ride”, “Can’t Buy Me Love”, “A Hard Day’s Night” and “Help!” are from the concert of 29 August 1965. 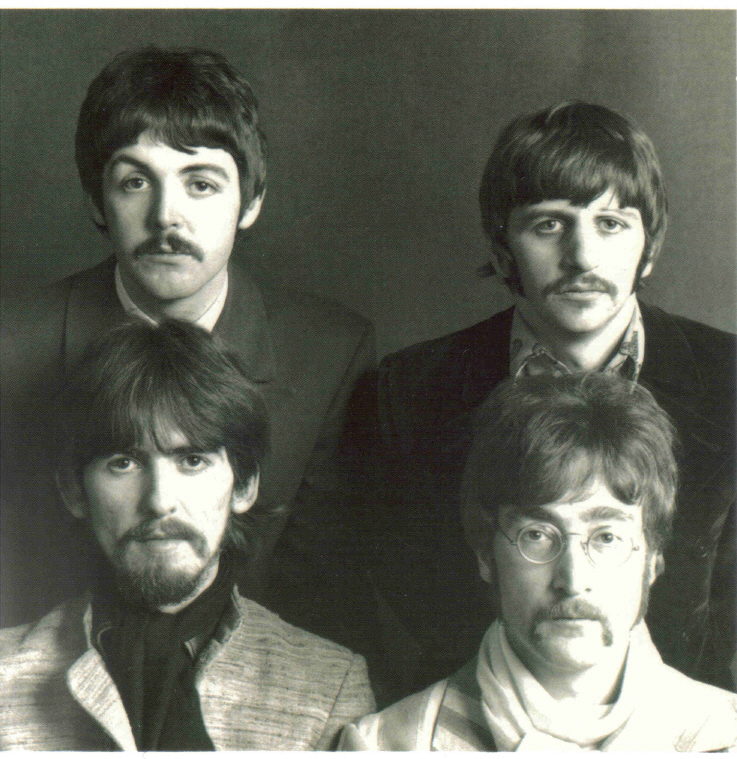 They have been edited together successfully by George Martin to make a highly enjoyable live album. 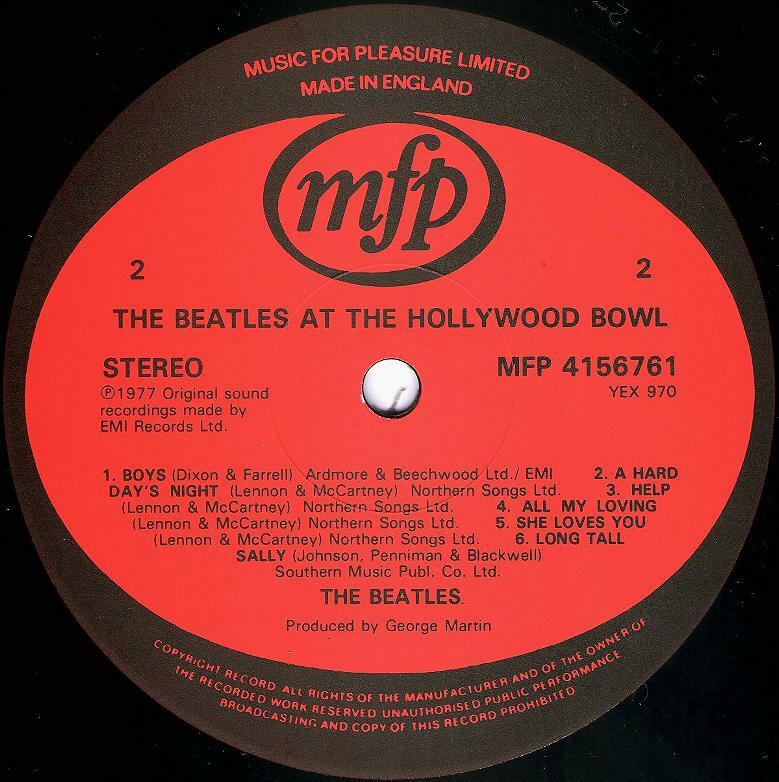 Because the original recordings were made on old-fashioned three-track machines, it was necessary to transfer them onto 16-track tape before George Martin and Geoff Emerick, his studio engineer, could filter, equalise and edit them. The major problem was that with continual use the tape heads of these old machines overheated and melted the magnetic tape. The resourceful Martin hit on the idea of using hair dryers blowing cold air to cool down the tape heads. 1. First pressing May 6, 1977. Release by Parlophone Records. 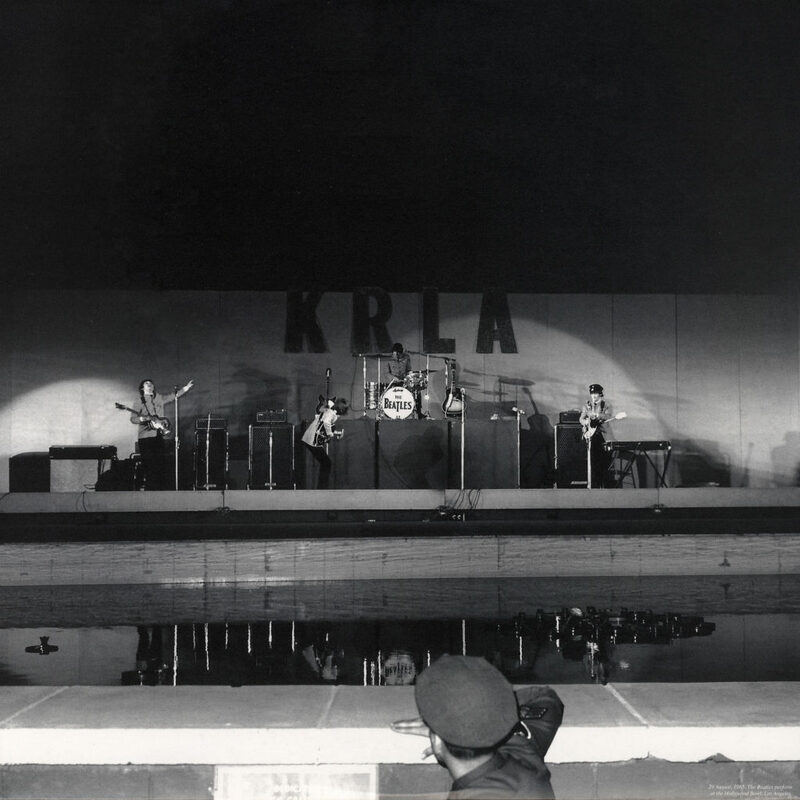 Black and white picture labels with silver capitol stile perimeter print: “…UNAUTHORISED COPYING PUBLIC PERFORMANCE AND BROADCASTING OF THIS RECORD PROHIBITED…” printed on the 5 o’clock. First matrix numbers: Side One: YEX 969-3U; Side Two: YEX 970-3Uwith “Mastered by Capitol” stamps and YEX 969-1, Side Two: YEX 970-1. Other matrix number variations: -4U/-3U; -3U/-4U; -5U/-3U; -5U/-4U; -2/-1; -2/-1; -5/-1; -2/-1. 2. Second pressing between 1980 and 1984. 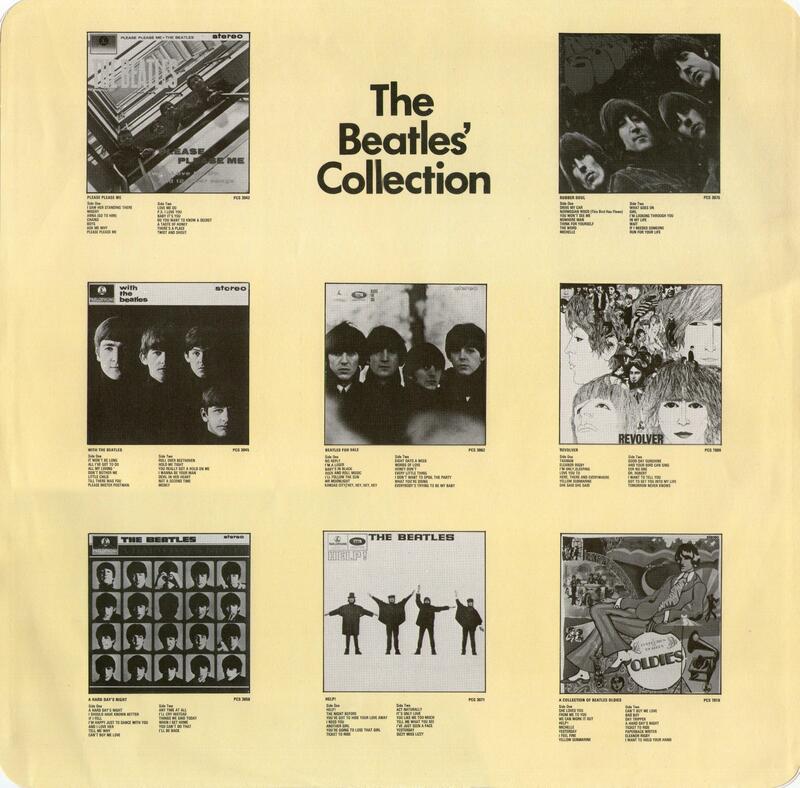 Release by Parlophone Records. Black and white picture label with grey non-capitol stile perimeter print: “…Unauthorised public performance broadcasting and copying of this record prohibited…” printed on the 5 o’clock. Matrix number variations: YEX 969-6/YEX 969-6 (possible -7 or -8). 3. Third pressing, Septenber 3, 1984. Release by Music For Pleasure Records, MFP 4156761. 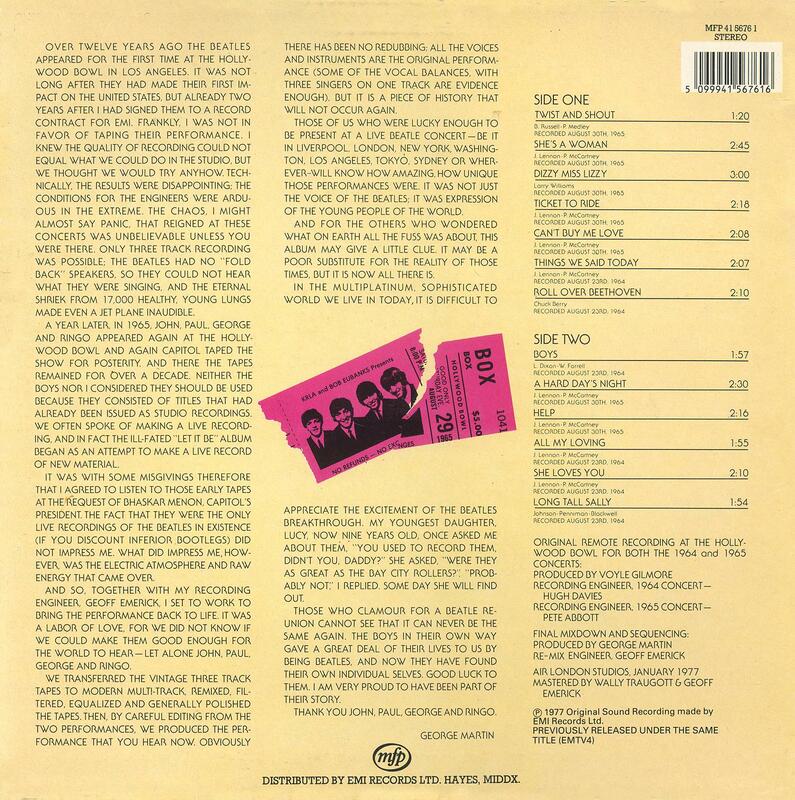 Unlaminated non-gatefold sleeve with MFP logo on the front and with bare code on the back side. Instead of the original inner sleeves were used standard white paper inner sleeves. 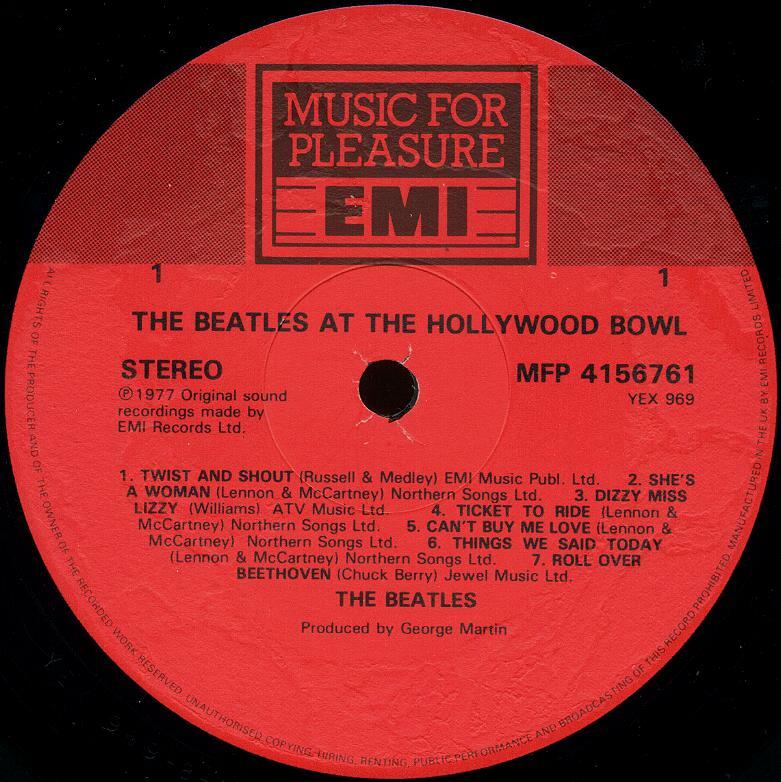 Black and red oval labels with MFP logos and red print: “…unauthorised public performance broadcasting and copying of this record prohibited…” printed on the 6 o’clock. Matrix numbers: YEX 969-8-1-1/YEX 969-9-1-2. 4. 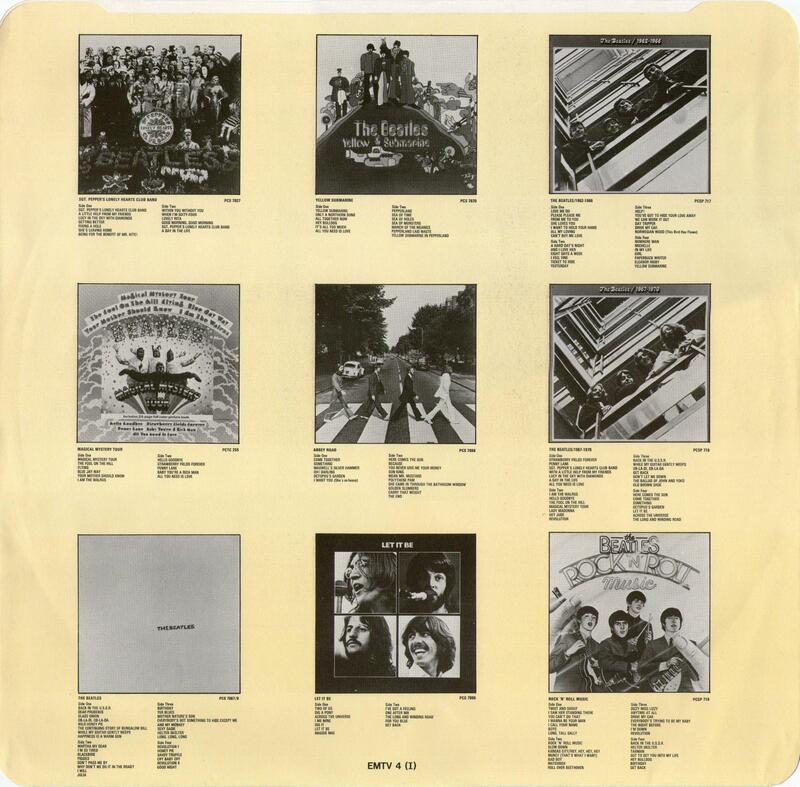 Fourth pressing, 1987 – 1990. Release by Music For Pleasure Records, MFP 41 56761. Unlaminated non-gatefold sleeve with red and maroon tickets on the front and maroon ticket on the back side. There is a bar code. 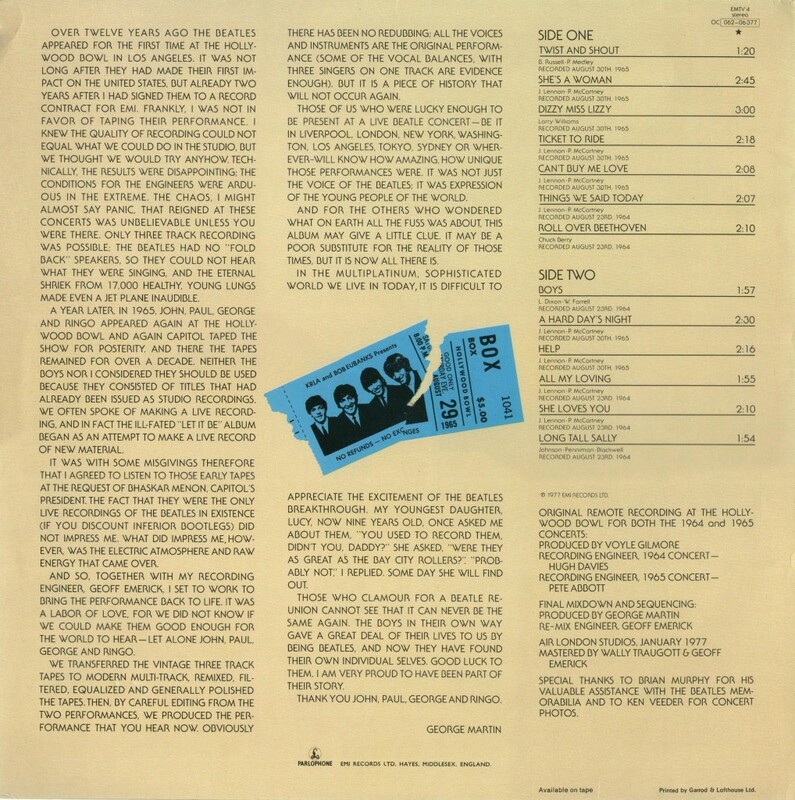 Instead of the original inner sleeves were used standard white paper inner sleeves. 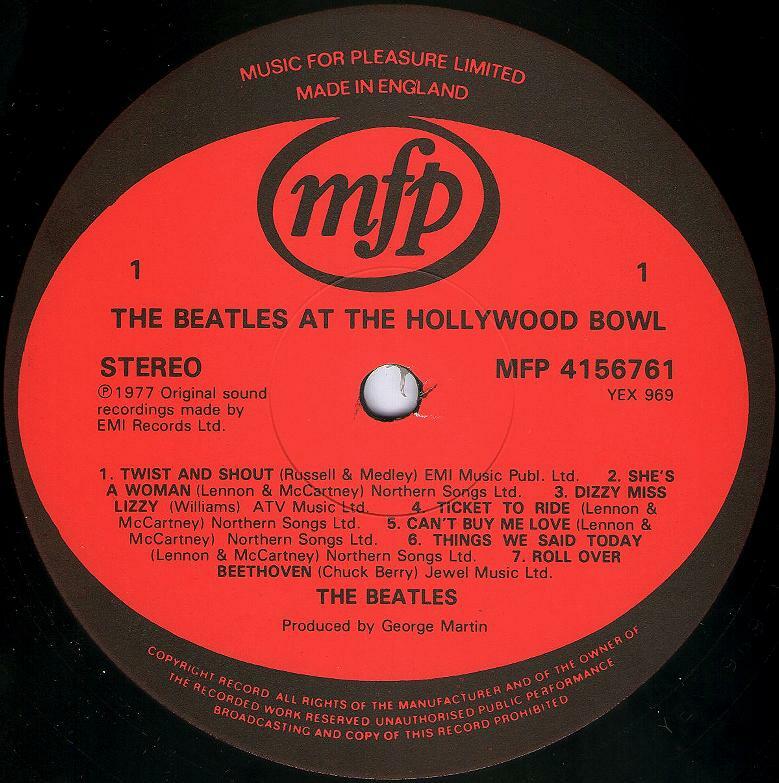 Red labels with boxed MFP logos and black print: “…unauthorised copying, hiring, renting, public performance and broadcasting of this record prohibited…” printed on the 6 o’clock. Matrix numbers: YEX 969-8-1-1/YEX 970-9-1-5. 5. Fifth pressing (remastered), November 18, 2016. 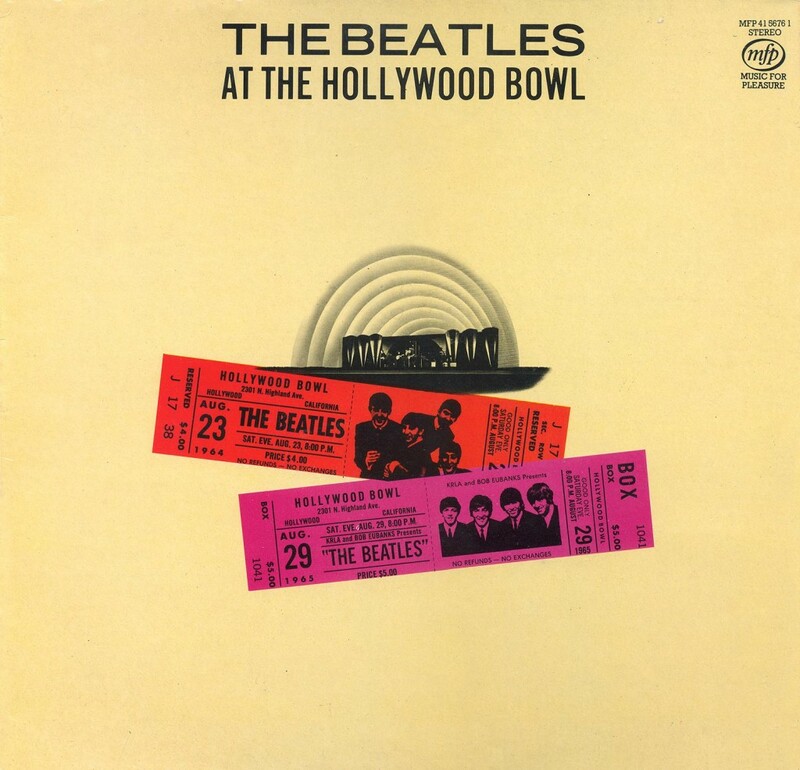 Entitled “The Beatles: Live At The Hollywood Bowl”, 602557054996. 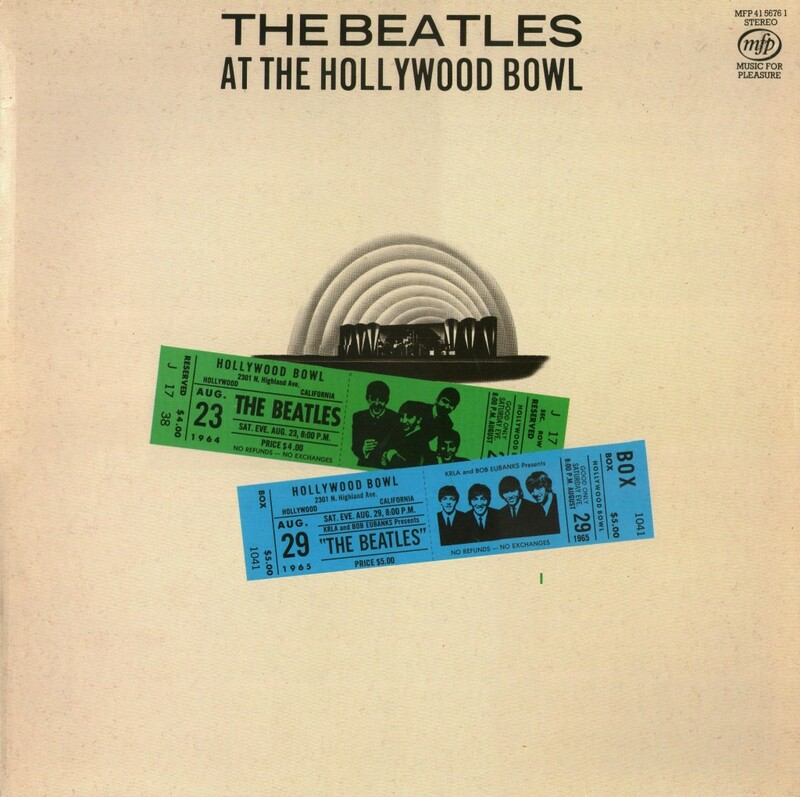 January 9th, 2016 Apple Corps Ltd. and Universal Music Group was released “The Beatles: Live At The Hollywood Bowl” on CD, a new album that captures the joyous exuberance of the band’s three sold-out concerts at Los Angeles’ Hollywood Bowl in 1964 and 1965. 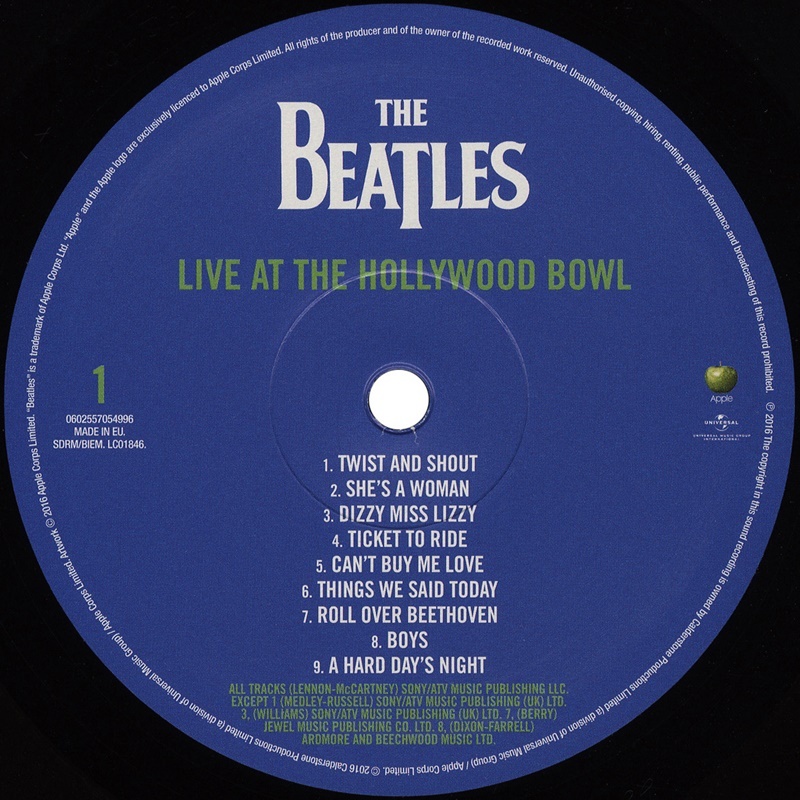 A vinyl LP was released on November 18. 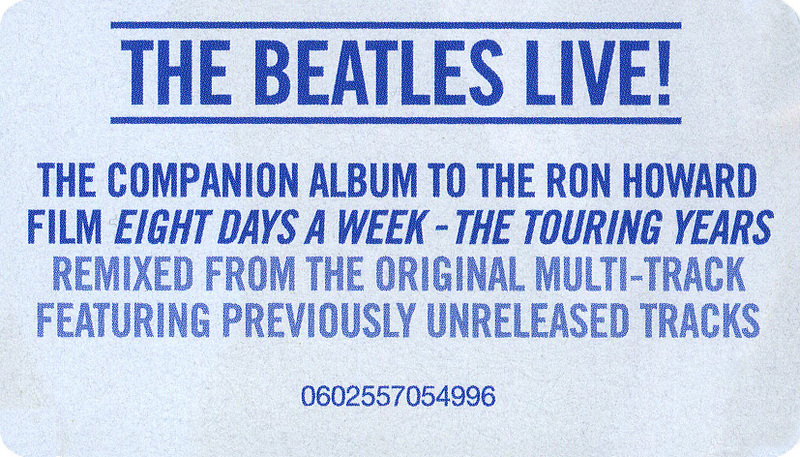 The album includes a new gatefold sleeve with an essay by noted music journalist David Fricke, and its cover art features a sunny photo taken on August 22, 1964. The new album was assigned the new catalog number: 602557054996. The remastering was overseen by Giles Martin. 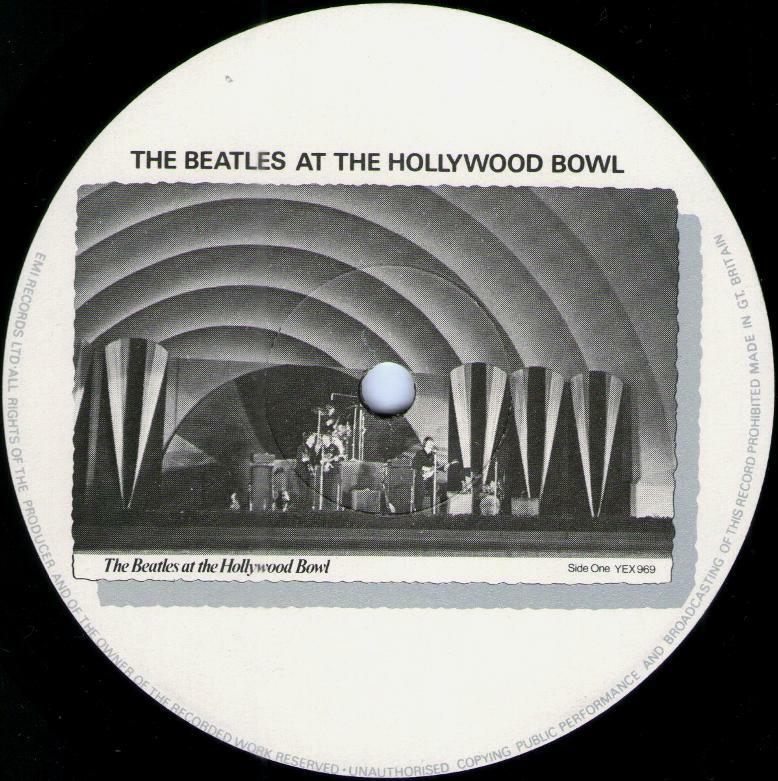 “A few years ago Capitol Studios called saying they’d discovered some “Hollywood Bowl” three track tapes in their archive,” says Giles. “We transferred them and noticed an improvement over the tapes we’ve kept in the London archive. Alongside this I’d been working for some time with a team headed by technical engineer James Clarke on demix technology, the ability to remove and separate sounds from a single track. With Sam Okell, I started work on remixing the Hollywood Bowl tapes. Technology has moved on since my father worked on the material all those years ago. 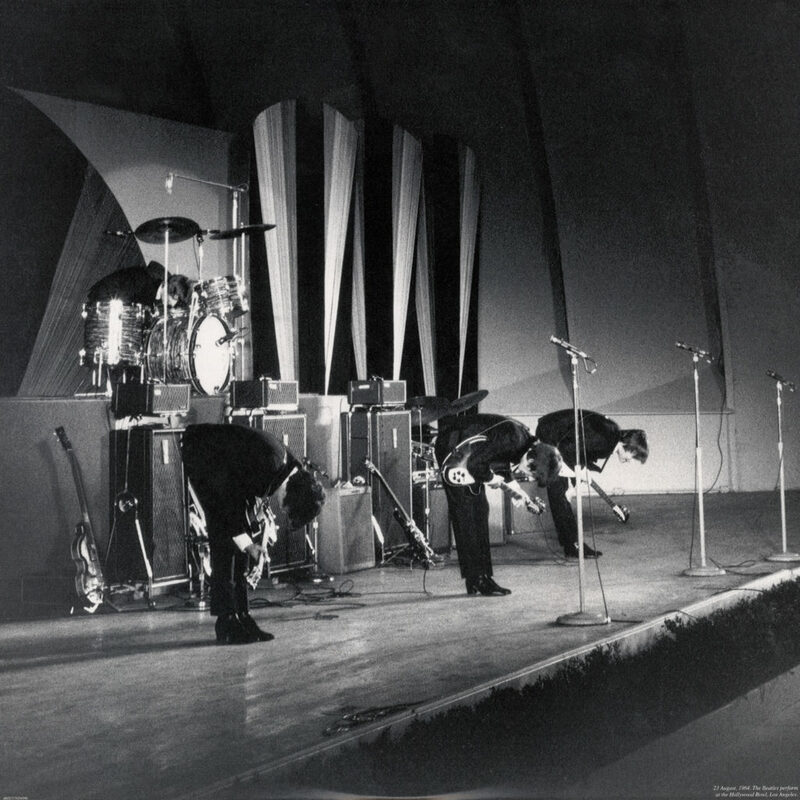 lads playing together to a crowd that loved them. 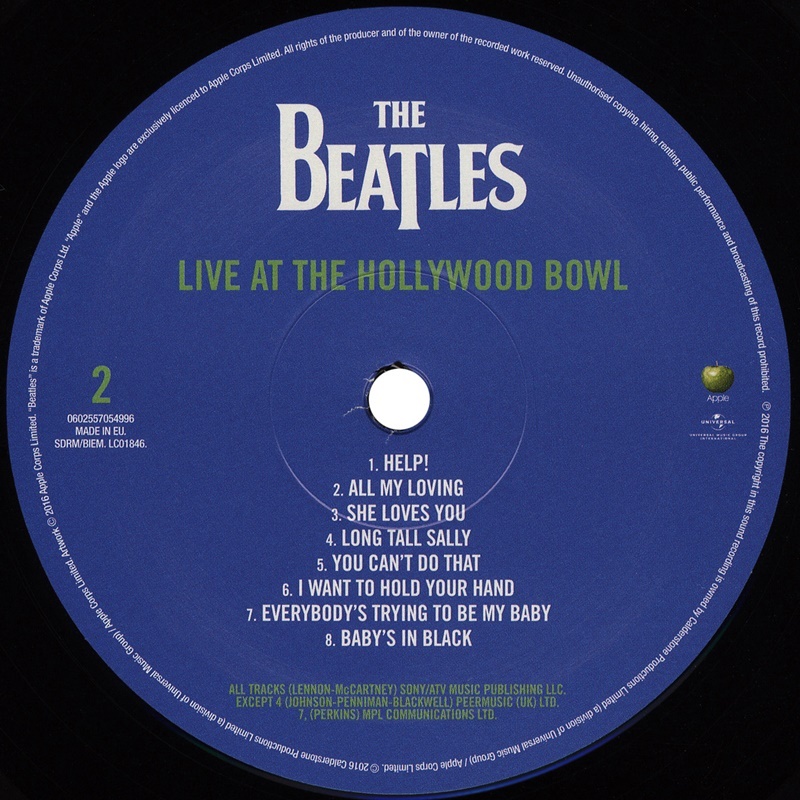 This is the closest you can get to being at the Hollywood Bowl at the height of Beatlemania…” Vinyl mastered by Alex Wharton. His name is in the matrix numbers. Variant 1: BG44532-01 A1 5705499 / BG44532-01 B1 5705499. Variant 2: BG44532-01 A1 5705499 1=µ / BG44532-01 B1 315 Alex i…i 5705499. Variant 3 (doubtfully): BG44532-01 A1 5705499 4=V / BG44532-01 B1 311 Alex i…i 5705499. Variant 4: BG44532-01 A1 Alex i…i 5705499 / BG44532-01 B1 Alex i…i 5705499.